Southern’s Arrow Drummer (left) works in the post against Wahama’s Adam Groves (right), during the Tornadoes’ 11-point win on Friday in Racine, Ohio. RACINE, Ohio — Comeback denied. 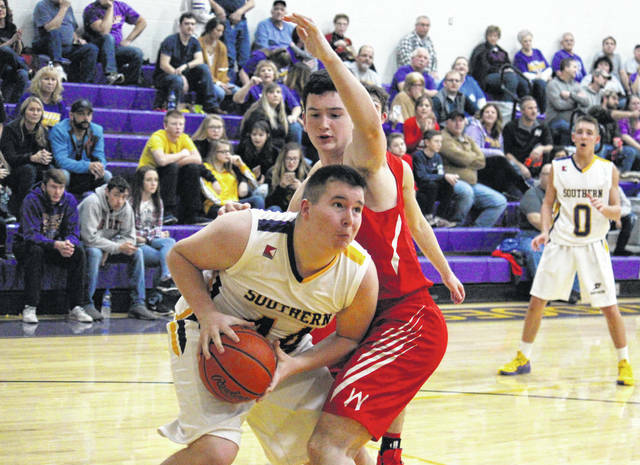 The Southern boys basketball team led by 16 points at halftime of Tuesday’s Tri-Valley Conference Hocking Division bout in Meigs County, and the Tornadoes held on for a 61-57 victory over guest Federal Hocking. Southern (8-7, 7-5 TVC Hocking ) trailed by a 17-13 clip after one quarter of play, but exploded for 27 points in the second period and led 40-24 at halftime. The Lancers (4-12 4-8) held SHS to just six points in the third period, and trimmed the margin to 10 points, at 46-36, with eight minutes to play. Federal Hocking poured in 21 points in the fourth quarter, but Southern sealed the 61-57 victory with 15 markers in the period. In the win, the Purple and Gold shot 22-of-59 (37.3 percent) from the field, including 5-of-13 (38.5 percent) from beyond the arc. Meanwhile, the Lancers made 20-of-56 (35.7 percent) field goal attempts, including 8-of-21 (38.1 percent) three-point attempts. SHS made 12-of-19 (63.2 percent) free throws, while FHHS was 9-of-12 (75 percent) from stripe. The guests won the rebounding battle by a 28-to-24 count, including 10-to-6 on the offensive end, but Southern committed 14 turnovers, six fewer than the Lancers. The Tornadoes combined for 16 steals, 15 assists and two blocked shots, while taking a trio of charges. The victors were paced by Weston Thorla with 21 points, followed by Jensen Anderson with 12. Cole Steele was next for SHS with nine points, followed by Arrow Drummer with six points and five rebounds. Coltin Parker scored five points in the win, while Austin Baker and Brayden Cunningham had three each, with Cunningham grabbing five rebounds and dishing out a team-best five assists. Trey McNickle rounded out the Tornado tally with two points. Steele, Drummer and Baker led the hosts on defense with three steals apiece, while Cunningham came up with two steals and two rejections. Hunter Smith and Brad Russell led Federal Hocking with 21 and 20 points respectively. Wes Carpenter and Elijah Lucas both scored six points for the Lancers, Collin Jarvis added three, while Ian Miller chipped in with one. This marks the season sweep of the Maroon and Gold for SHS, as the Tornadoes won by a 58-46 count on Dec. 11 in Stewart. Southern is slated to be back on its home court against non-league foe River Valley on Friday.